Following a sharp spike in risk premia in late May on uncertainties about new elections in Italy, markets mildly recovered from their state of emergency. Equities advanced in the US, but were still held back in the euro area also by a recovering EUR/USD and hints that the ECB will discuss ending QE this week. Markets partially recovered from the emergency mode on Italy over the past week, with equities stabilizing, core yields rising and the euro taking a breather. This week, the Fed and the ECB will remind markets that the hurdles to dissuade them from unwinding extremely accommodative monetary policies are high. The Fed is set to hike rates again, while the ECB may take another important step in preparing markets for the end of QE later this year. An ultimate decision on the termination to the ECB’s asset purchase program, however, may be postponed to the July meeting. Yields on core bonds recovered somewhat even though the data flow for the euro area continued to disappoint (retail sales, German industrial production). Italian BTPs recovered only briefly initially, but underperformed strongly over the second half of the week, with 10y BTP rising above 3% again. The new Italian PM Giuseppe Conte had struck a defiant tone towards the EU, stressing his confidence in Rome’s “negotiating power”; hints towards a prospective end of the ECB’s QE also weighed. This week, the Fed (Wed) and the ECB (Thu) will take center stage, with markets to scrutinize policy makers’ wording on heightened risks from political uncertainties in Europe, the adverse effects of the strong US dollar on EMs and trade war concerns lingering even more strongly after the summit of G-7 leaders this weekend ended in disarray. That said, the hurdles to dissuade the central banks from unwinding their accommodative monetary policies are still high. Regarding the Fed, another rate hike of the Fed Funds Rate by 25 bps (to then 1.75 -2.0%) is highly likely after the strong labor market report for May and reassuring ISM readings. 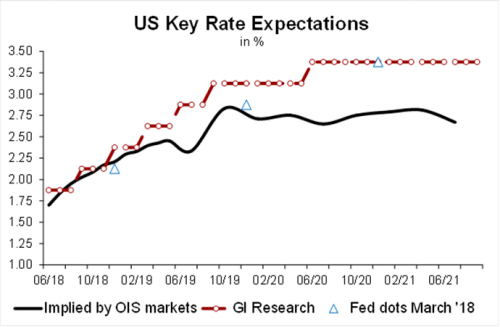 The updated Fed’s rate projections (‘dots’) will be closely watched for a further upgrade from the currently projected total of three rate hikes this year. We still anticipate a somewhat steeper path (see chart), leaving quite some leeway for market expectations to rise over the coming months. The ECB will likely refrain from any change in monetary policy stance right now. But the Governing Council is set to hold a pivotal discussion on the future of its QE program at its meeting in Riga on Thursday, as already anticipated by ECB Chief Economist Peter Praet, with President Draghi likely to signal that a decision about timing and design of terminating QE is due at the July meeting. In our base case, we anticipate the ECB to decrease its purchases from currently € 30 bn/month to zero by year-end. The ECB is also due to present its updated macro projections. A focus will be on whether the staff growth projections will be reduced following the softer string of data over recent weeks and the rise in uncertainties over global trade and EMU political uncertainties. This week is overall light on data releases. US price data for May (Tue) will likely show annual inflation exceeding 2.6%, underpinning the case for a Fed rate hike. On Thursday, Chinese data for May will likely show resilient industrial production growth while retail data will likely corroborate healthy consumer demand in the US.